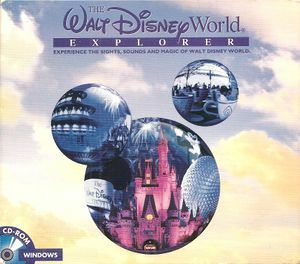 This page covers both the original 1996 release and 1998's The Walt Disney World Explorer – Second Edition. Technically, this is an application that was made to promote the Walt Disney World Resort in Florida, not a game. It has a few minigames, however. Installing the Second Edition to the same folder as the original version will overwrite it, meaning that if a user wishes to downgrade back to the original version, then the Second Edition would have to be uninstalled first. Although the program handbook for the Second Edition states that the original version must be uninstalled first, users can just run the installer normally without having to uninstall the original version first. It's also possible to have both versions installed on the same machine if they're installed on separate directories. Despite the low resolution, the application runs well on modern systems, although some Windows Compatibility Mode settings are required to fully replicate the original experience and improve legibility on high resolution screens. AVI videos may not play within the application; see AVI videos not available below for a fix. Application (both the original version and the Second Edition) uses a 16-bit installer, despite the presence of 32-bit InstallShield 3 Engine files on the disc(s). A workaround is available (see Installing on 64-bit versions of Windows). This application is not available digitally. The application runs at 640x480. Any unused space on a monitor is blacked out. Use Windows Compatibility Mode to upscale the application and improve legibility on large resolution screens. It's only for scrolling through the main overworld, viewing the 360° panoramas, and dragging the monorail on the Walt Disney World Timeline. None of the animations run at 60 FPS and the full-motion AVI videos are 15 FPS. The application runs at 256 colors. Required to use the application. Audio is monaural; all Wave audio tracks are in mono and have a sample rate of 22050 Hz. Application mixes all stereo tracks (should one be used in place of one of the application's tracks) down to mono. Without Windows Compatibility Mode, any audio that was last playing when the focus was lost will restart upon returning to the application. With Windows Compatibility Mode, the application will continue running in the background uninterrupted; any slideshows, audio, and animations will continue to play even though the audio is muted from loss of focus. All fixes apply to both versions. Both original and Second Edition disc releases use a 16-bit installer. Create a new folder somewhere on your hard drive and copy the contents of the disc to it. Download the InstallShield 3 32-bit Generic Installer. Extract the new installer into the folder you made. Run setup32.exe and follow the steps. You can leave the folder with the copied CD files on your computer if you want to run the game without the disc inserted. If setup32.exe isn't working properly, check to see if there are any other processes preventing it from running normally. Open the Task Manager, go the Details tab, right-click on setup32.exe from the list, then select "Analyze wait chain" from the context menu. If there are any processes running that are causing the conflict, such as the Logitech Gaming Software's Discord applet, tick the box(es) for the conflicting process(es) and click on the "End process" button. After installing the application on a modern machine and going through the mandatory restart after setup, blank Explorer.exe errors with yellow warning signs appear on startup, and the machine always opens the File Explorer windows that were open when the application was being installed. This is due to the application adding a deprecated string value to the Windows Registry during the setup that was supposed to be deleted upon returning to Windows after the restart. In the Registry Editor, go to HKEY_CURRENT_USER\Software\Microsoft\Windows NT\CurrentVersion\Windows. Delete the string value named "run". The error as seen in the application; the video that is playing but cannot be properly shown is the "Backstage" video for the "Walt's Dream" topic. When playing AVI videos from within the application on a modern computer, the application will only play the audio and show a white box with black diagonal lines and a message that says, "Video not available, cannot find 'vids:IV32' decompressor." Download the Indeo 3.2 codec (file name: indeo32.exe). Run indeo32.exe as an administrator. While the application runs well on modern machines, it can only play one audio file at a time when running natively on such. This means that sound effects from elements seen in the overworld maps and from clicking with Tinker Bell will not play; only the background music and the narration (which is supposed to play on top of the music, but instead interrupts it). You can ignore this fix if you want to hear the overworld narration more clearly or if you find the sound effects distracting. Open the properties for wdw25.exe (the application's executable). Under the Compatibility tab, enable Compatibility mode (tick the box that says "Run this program in compatibility mode for:") and select "Windows 95" from the dropdown menu. (Optional) If you also wish to upscale the application's screen to be able to see the application more clearly and improve text legibility on a large resolution screen, tick "Run in 640 x 480 resolution". Click "OK" or "Apply" to apply the new settings. When running the application on a virtual machine, the Tinker Bell cursor jumps to the corners of the application's screen when moving her, hindering usability. This bug also causes the main Walt Disney World overworld map to scroll too fast. This is probably because of how the virtual machine traps the cursor, which causes a problem for the application as it also traps the cursor within its screen. Install it on the native OS. Follow any of the fixes above if you need to. Walt Disney World Quiz Challenge minigame. Information is taken from both the original release and the Second Edition. Information is taken from the original release only. This page was last edited on 14 April 2019, at 10:26.